Georg Tappert was born in Berlin in 1880. He began his formal artistic training in 1901 at the Karlsruhe Academy and worked as an assistant to Paul Shultze-Naumburg in 1903. In 1905, Tappert moved to Berlin and then to Worpswede, where he helped found the Art School in Worpswede. In 1910, Tappert co-founded the School for Visual and Applied Arts in Berlin and the Neue Sezession (with Pechstein and others). He was appointed “first executive officer” of the Neue Sezession and exhibited with them until 1914. In 1911, Tappert helped found the Jury Free Art Show, and in 1912 he began teaching in Berlin. During the First World War, Tappert was drafted into the infantry, where he served until 1918. Tappert was co-founder of the periodical Die Schöne Rarität, one of the founding members and organizers of the Novembergruppe, and a member of the Arbeitsrat für Kunst. Tappert exhibited with the Novembergruppe from 1919 until 1929. 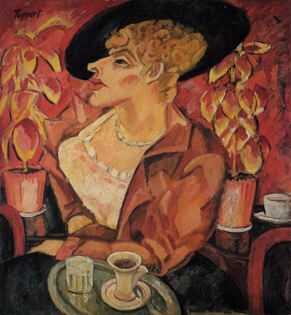 In 1919, Tappert resumed teaching in Berlin at the Reimann School and the United State Schools for Fine and Applied Arts. In 1922, he was appointed to the National Office for Art Examiner, where he served until the National Socialists came to power in 1933. In that year, while teaching at the United State Schools, Tappert was dragged from his class by Nazi students, who demanded his dismissal. He was temporarily ousted and then reinstated the same year. In 1937, Tappert was dismissed from his teaching position and included as an example of “artistic decay” in the pamphlet “The Cleansing of the Temple of Art.” This same year, Tappert’s works were removed from public collections in Germany. After the destruction by bombing of his Berlin studio in 1944, Tappert decided to stop painting.